A spectacular sea view and a warm welcome await you at Ann Schroeder’s home studio. In Mabou Harbour, winds blow fiercely, the ocean is bright or dark, hillsides sprout hay bales, and fiddlers play under starry skies. This rich brew infuses Ann’s painterly wall quilts that evoke Cape Breton’s landscapes, weather, and music. 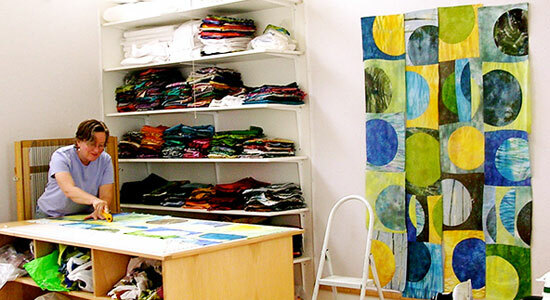 You’ll also find a large assortment of unique hand-dyed silk, cotton, and rayon scarves. Nearby attractions include the Red Shoe Pub, Mabou Farmers Market, beautiful West Mabou Beach, Glenora Distillery, and Cabot Links golf course. Ann’s fine art quilts have been shown at Quilt National in Athens, Ohio, the Mary Black Gallery in Halifax, and the Inverness County Centre for the Arts. They have been published in Art Quilts: A Celebration and Fiberarts Design Book Six.